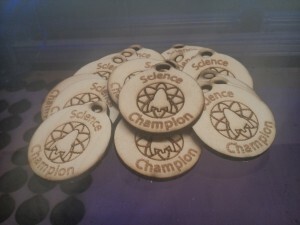 We were itching to give our laser cutter a good trial run, when our friends over at Science Hack Day Dublin need some medals created. 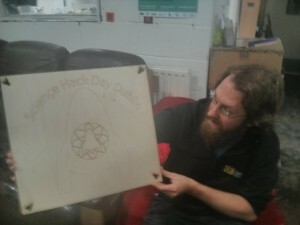 We started off with their logo and reworked to make it more laser cutter friendly. Check out the results below. If your interested in laser cutting drop by the space sometime. For a bit of fun, we also made a large sign. Namit is very happy with his work. This was written by tdr. Posted on Saturday, November 15, 2014, at 1:57 am. Filed under Hackathon. Bookmark the permalink. Follow comments here with the RSS feed. Post a comment or leave a trackback.